At Newbridge Heating Centre we believe that air quality is important, as both history and research by environmental scientists tells us that many pollutants can have a negative impact on our health. Pollutants such as sulphur dioxide, carbon monoxide, nitrogen oxide, and particles have sources as diverse as diesel engines, power stations central heating systems, fires and even stoves. People are living longer, and to ensure this continues means finding a way of doing all we can to improve air quality. Ever since February 2011 countries in the European Union have been working towards creating a low carbon society by 2050. Here in Ireland the government has stated, (in its recent white paper Ireland’s Transition to a Low Carbon Energy Future), that emissions from the energy sector will be reduced by at least 80%, compared to 1990 levels, by 2050 before falling to zero by 2100. This will mean a vast improvement to air quality. Given that 25 percent of all Irelands energy is consumed heating and powering homes (Irish Independent 8/8/16), To achieve this target will mean an ambitious energy transition is required, involving every business, community and citizen in the country. There are a number of ways in which Newbridge Heating Centre can enable you to help the country make this transition happen. The first and possibly easiest is to replace an open fire with an efficient wood burning appliance. Multi fuel stoves that allow the burning of smokeless coal and peat are gradually being phased out of production, as it is harder to ensure that particle emissions remain sufficiently low to meet ever more demanding standards. Indeed, by 2020 the leading manufacturers will only be manufacturing wood-burning stoves, two years ahead of schedule. To ensure that the wood burning appliance burns in a way that minimises the formation of carbon monoxide and emits as few particles as possible; it is important that you choose a good quality stove. It is then imperative that you have it installed by a HETAS trained installer, to ensure it burns safely and efficiently. Presently there are a few stoves on the market that meet these new requirements including the Di Lusso R4 from Hunter, and the Charnwood Cove 2 BLU. These can be seen at Newbridge Heating Centre’s Warmer Winter Weekend in September. 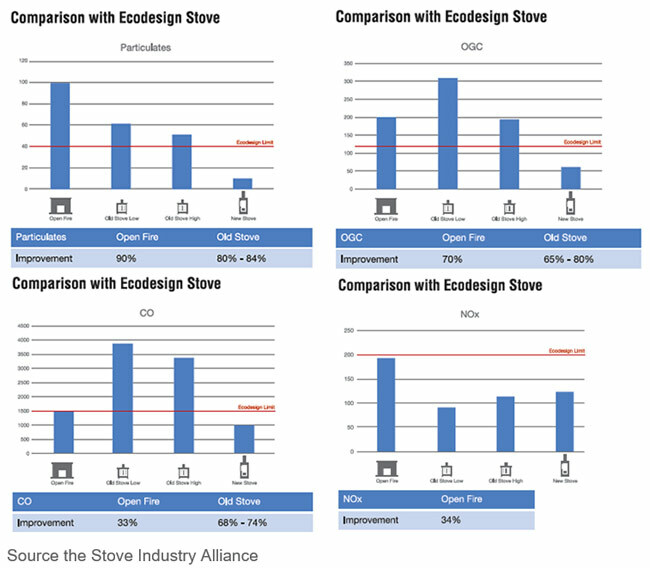 To examine how significant, the reduction in emissions from a stove manufactured to the Ecodesign standard would be compared to an open fire, and a that of a stove manufactured ten years ago, independent research was carried out by Kiwa Gastec on behalf of the Stove Industry Alliance. The tests covered the emission of particles, other carbon gases (OCG) and Nitrogen Oxides (NOx) from an open fire, a stove from 10 years ago and a stove designed to meet the stringent emissions levels allowed in Ecodesign stoves. The results are shown in the graphs below. These graphs help to show that the Ecodesign stoves will lead to improved air quality across Europe, and every homeowner can play their part.